At Super Dispatch, we want to make sure you can request all the features you want. Your feature requests are the reason that everyone loves our TMS. After all, you know best. Open your Super Dispatch app on your Android phone. Log in like you normally would. At the bottom of the screen you will see your usual 5 button options: Active Orders, Delivered Orders, Archived Orders, HoS and Profile. Click "Profile:"
3. Now you are in your profile. Find the button that says "Feature requests and votes" and click on it. 4. Now you are in the "Feature Request" section of your profile. Here you can make a feature request and view all requests from all users. 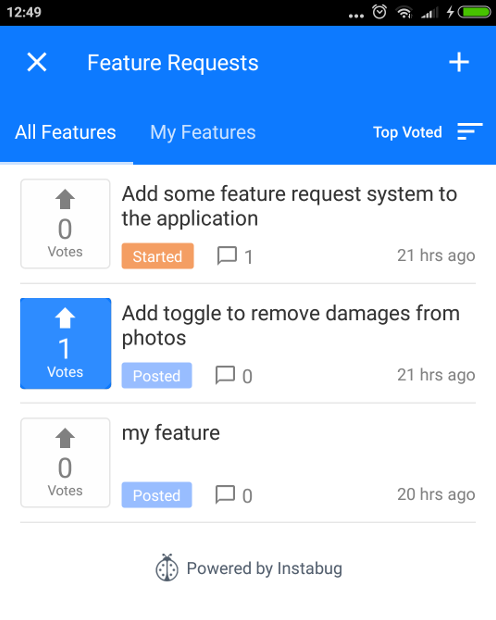 You can also see the status, votes and comments for all feature requests. 5. To ADD a feature, Click the "+" sign in the top right hand corner, and fill out the page that pops up. 6. To VOTE for a feature you like, find the feature you like. Then click the box to the left of that feature that says "VOTES." 7. To COMMENT or READ a comment on a feature, click the box with the title of the feature. That will bring you to the feature request page for that feature, and you can read or add comments there.